Fresh Fruit Salad tossed with a lime and mint infused simple syrup. Okay. I'm a gonna say it again. It is HOT y'all. Whew! Magazines are arriving all decked out in the unmistakable colors of fall, loaded with fall baking recipes, chilis, soups and stews, and apple recipes are everywhere, even already with many bloggers. A Florida Sam's Club even has Christmas decorations out now. Yes. In August. I'm serious y'all! And, while I'm so ready for some fall weather to show up myself, with the heat of 100+ feels like temps slapping us in the face everytime we walk out of the door here, well fall, I'm just not that into you. For the Deep South, fall won't come along for awhile yet and summer, like an unwelcome guest who stays just a little bit too long, is often still here far past the fall introduction anyway, so bring on the icebox desserts, frozen treats, summer cocktails and quick meals I say! Add fruit to that list too, because during these hot summers I almost always have a mixture of fresh fruit in the fridge - watermelon, strawberries, grapes, cantaloupe - I love it all. The Cajun isn't a big fan of fruit, except maybe when it's in a hand pie or some other fruit dessert, so putting it together in a dressed fruit salad is a great option that will last me until I have a craving for another one that's a little different. 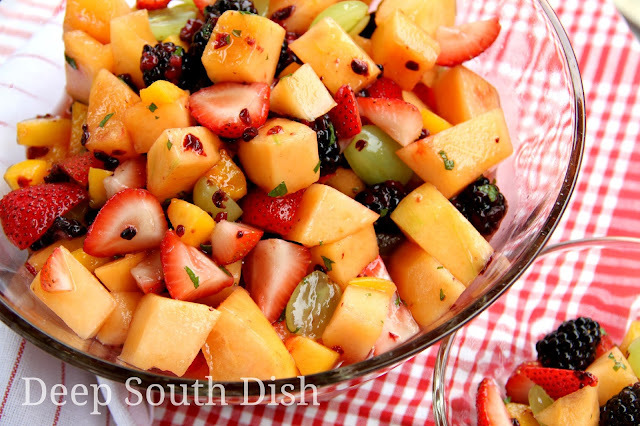 You can dress fruit salads in a variety of ways. A fresh egg custard sauce is a great option and certainly one that we really love during the holidays. Most of us are familiar with the fruit cocktail salad mixed with both canned fruit cocktail and seasonal fresh fruit, dressed with a packet of jello pudding or a can of peach pie filling. Sometimes sour cream or mayonnaise makes an appearance, and often, just a simple fruit juice. I wanted to try something different this time, so I went with a simple syrup base, infused with fresh mint. I also found some pretty fresh blackberries, so I added them in my salad this time. Do remember that blackberries have seeds and if the seeds are off-putting to you, opt for other berries or fruit, or just stick with good ole strawberries in their place. You just want a nice mix of fruit for about 12 cups overall. Use whatever you like! I keep a mint plant growing in a pot on my patio. The plant has actually been with me a couple of years now, and it's really nice to have for things like this, or minted tea, or the occasional mojito. In a pot, that is. Mint is very invasive and a lot of folks make the mistake of planting it in the ground and find, very quickly, that it spreads like a weed ground cover and is virtually impossible to get rid of once that happens. So grow some, because it is really easy to grow, but keep it in a pot to protect your sanity. Toss that lovely syrup with your fresh fruit and tell me, truthfully, is that not scrumptious looking or what? Let it chill nicely in the fridge for just a couple of hours and serve soon after. Don't try to make this up way in advance though. Check out more of my fruit salad recipes on Pinterest! Bring water and sugar to a boil, stirring until sugar is dissolved and mixture is completely clear. Stir in the lime juice, half of the mint and salt; set aside to cool. Wash, chop or slice fruit and place into a large bowl, tossing with the remaining mint. Stir in the cooled syrup and refrigerate until well chilled. Gently toss and serve; refrigerate any leftovers. Cook's Notes: Vary the fruit to your liking using about 12 cups of assorted sliced or chopped fruit, such as cantaloupe, honeydew, seedless watermelon, blueberries, blackberries, green or red seedless grapes, quartered strawberries, sliced kiwi, peaches or nectarines, to name a few. May also add 1 large firm banana, sliced, if desired, however, toss in the slices just before serving. May also use a sugar substitute, such as Splenda. Citrus Salad: Replace mixed fruit with a combination of citrus - choose from red and white grapefruit, clementines, naval oranges, tangerines, blood oranges, etc. Cut away peel and pitch and cut into crosswise slices rather than segments. Arrange fruit on serving platter, alternating slices and slightly overlapping them. Prepare dressing as above and drizzle dressing on top until fully coated, reserving any leftover dressing for the table. Refrigerate until well chilled. Oh my! That looks and sounds delicious! Thanks Eva - nice to see you! This looks refreshing and delicious!